Gizzy and Mouse are 14 years and 11 years old respectively and came into CPL care because their owner passed away. Gizzy (grey and white) and Mouse (white and ginger) are both sociable and chatty nana cats. Gizzy is the more outgoing, but Mouse is happy to make friends with you once Gizzy has checked you out. 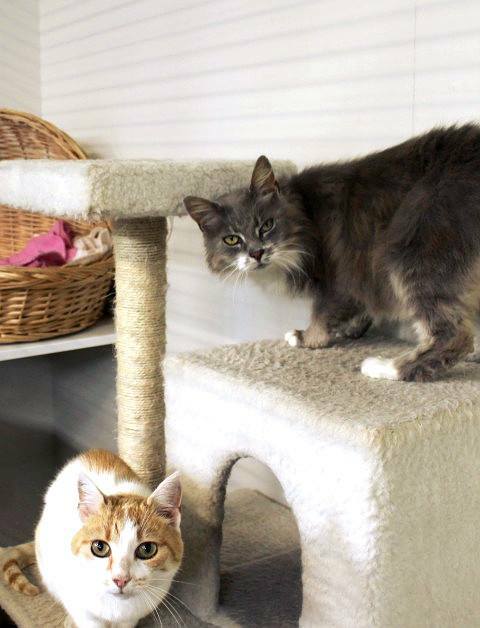 They are closely bonded and are looking for a peaceful and comfy new home without any other pets where they can enjoy their twilight years together. Gizzy has miliary dermatitis (flea allergy) so she will need regular flea control.